CHINESE investors may own less than 1 per cent of Australian farmland, but the true level is not known because it is hidden behind a corporate veil, according to a new report that offers support to the establishment of a formal register of foreign land ownership in Australia. A joint report by accountants KPMG and the University of Sydney says Chinese investment in Australian agricultural land totalled more than $1 billion between 2006 and 2012, or just 3 per cent of that country’s investment in Australia over the period. 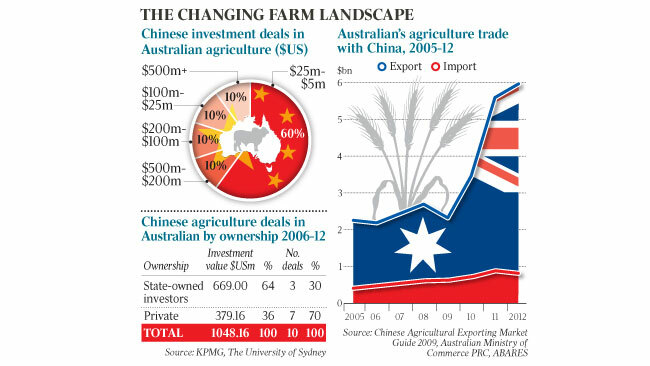 While there is anecdotal evidence of Chinese investors buying agricultural properties worth less than $US5 million ($5.2m), “detailed public information on such deals is nearly impossible to obtain”, the report, Demystifying Chinese Investment in Australian Agribusiness, says. The true identities of the landowners were not known as deals were made through through individual, corporate or trust structures. “Until we have a national record of foreign ownership of Australian land that looks through the corporate veil, it will be difficult to establish the extent of Chinese ownership below $US5m,” the report says. Both the government and the opposition separately committed before the election to establish a register of agricultural land and agribusiness ownership to address concerns that foreign investors were buying up the farm. The government is also pursuing changes to foreign investment rules that would lower the threshold at which the Foreign Investment Review Board would need to review deals, from $248m to $53m for agribusinesses and $15m for farmland. The KPMG/Sydney Uni report says foreigners own an estimated 11.3 per cent of Australian agricultural land and that Chinese investors may own less than 1 per cent. However, the report says investments below $US5m are less relevant to the investment debate because of the small scale of the assets, the apparent lifestyle choices behind such deals and the absence of any effort to aggregate such holdings into large farm enterprises. The report estimates the value of Chinese investment in Australian food and fibre production at just over $1bn over six years, including the purchase of cotton farm Cubbie Station by Shandong Jining Ruyi, smallgoods wholesaler Manassen Foods by Bright Food Group and Tully Sugar by China National Cereals, Oils and Foodstuffs Corporation. That represents just 3 per cent of the total Chinese investment in Australia. However, the report warns that Australia should not expect to see many large-scale deals because many of the largest and most attractive businesses in the dairy, grains, sugar and food processing sectors are already foreign-owned. Australian farms are still mostly held by small family owners, with 55 per cent of the 135,000 farm businesses having an estimated operating value of less than $100,000. The report says China’s emerging food needs are centred on food safety – because of recent high-profile scandals involving meat and milk – rather than food security and that Australian businesses should look to partner with Chinese companies to exploit China’s growing demand for safe, premium fresh and processed foods. It also urges companies not to wait for a free trade agreement with China but to consider memorandums of understanding such as those signed by Western Australia, Queensland and South Australia that have opened up commercial opportunities. Separate figures from the Australian Food and Grocery Council show exports of food, beverages, groceries and fresh produce increased by $1.1bn between 2010-11 and 2012-13. This entry was posted on Tuesday, October 29th, 2013 at 8:24 am and is filed under Uncategorized. You can follow any responses to this entry through the RSS 2.0 feed. You can leave a response, or trackback from your own site.